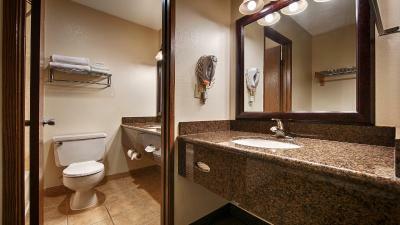 Lock in a great price for Best Western Hi-Desert Inn – rated 8.7 by recent guests! Standard hot breakfast items, fruit, etc. Standard (good) hotel of the Best Western chain. The BBQ / Brewery place across the street was unexpectedly good. There's a mining museum and property nearby where you can take a self-guided walk to exhibits (fee). 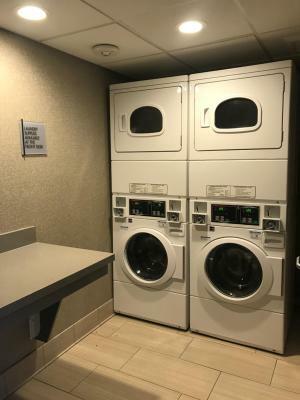 The amenities are great; breakfast, coffee (esp the cookies), available workout room & laundry and in room coffee/microwave/refrigerator. The breakfast was super and the staff were super polite, helpful and cheerful. Breakfast, fresh baked cookies, clean cozy room, friendly staff. It smelled amazing everywhere in the facility. So roomy and quiet. Always fresh cookies available. It was pretty ckean and it was quiet and comfortable. Very friendly staff. Very comfortable beds. Nice and clean. I was in a newly remodeled room in the Annex. Nicely appointed and quiet. Large room. Comfortable bed and pillows. My wife left her jacket in the closet. We phoned the hotel and they offered to mail it to us. Much appreciated. 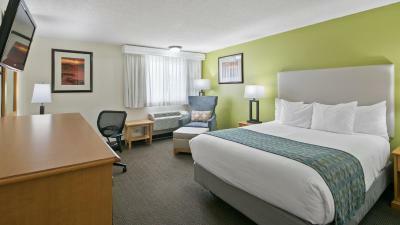 Best Western Hi-Desert Inn This rating is a reflection of how the property compares to the industry standard when it comes to price, facilities and services available. It's based on a self-evaluation by the property. Use this rating to help choose your stay! A satellite TV, microwave and small refrigerator are featured in each air-conditioned room at the pet-friendly Best Western Hi-Desert Inn. A work desk, hair dryer and tea and coffee-making facilities are provided. A daily hot breakfast buffet is served from 6:00am-9:00am and may include fresh waffles, homemade cinnamon rolls, eggs, meat, pastries, fruit, yogurt, cereal, gluten-free options, coffee and juices. Freshly-baked cookies are available in the afternoon. A 24-hour front desk is offered at Tonopah Best Western Hi-Desert Inn. A free transfer service to the Tonopah Airport, 5 miles away, is offered. The Tonopah Test Range is 20 miles away. The Extra Terrestrial Highway and Area 51 are 70 miles away. 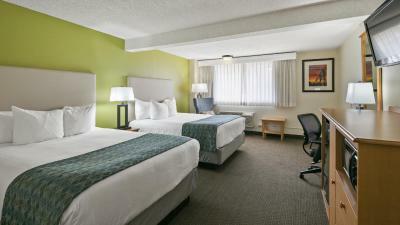 When would you like to stay at Best Western Hi-Desert Inn? This suite has a iPod dock, microwave and air conditioning. 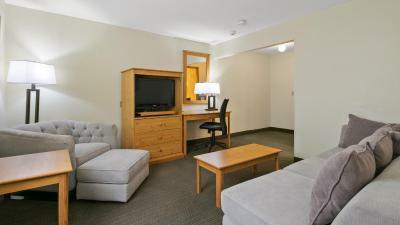 This double room features a microwave, iPod dock and air conditioning. This suite features a microwave, iPod dock and air conditioning. This double room features a iPod dock, microwave and air conditioning. This quadruple room has a iPod dock, seating area and microwave. This quadruple room has air conditioning, microwave and iPod dock. House Rules Best Western Hi-Desert Inn takes special requests – add in the next step! Best Western Hi-Desert Inn accepts these cards and reserves the right to temporarily hold an amount prior to arrival. Pets are accepted with advance approval. If pet is left unattended in room, additional fees will apply. Breakfast was awesome! The woman who assists in the breakfast room made me feel like I was enjoying a warm breakfast at an old friends home. Thanks for starting my day with hot coffee and a warm heart! I’m very satisfied with my stay. Not much. A bit pricey, but they do offer a lot others don't (I have stayed other places in Tonopah). The fact the pool is not open would have been nice to have it be open and heated. The only complaint was (as already addressed) there was no shampoo or conditioner in the room. gym very small and not all was working. during winter time it was cold at room so I had to use loud fan heater. good breakfast variety. comfortable bed and room. parking place near entrence. close to local brewery and few more restaurants at town. Maids could clean a little more thoroughly in corners, mostly in the bathroom.